SYNOPSIS: Breaking up is hard to do. So why not get someone else to do it for you? Better still, why not capitalize on romantic failure and turn it into a profitable business? That's the plan Aaron Felting and Dana Larson hatch over tea and cookies after meeting in San Francisco’s Golden Gate Park. Although Aaron falls for Dana, he soon finds she’s more interested in being the CEO of their successful Silicon Valley startup created to end the romantic entanglements of strangers than their own relationship. 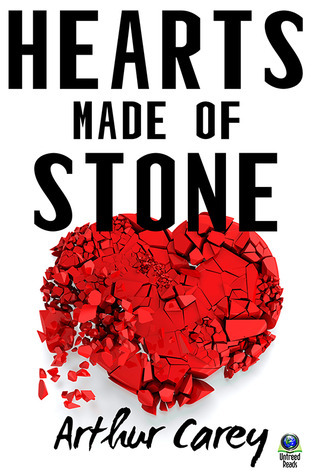 REVIEW: It was refreshing for me to read Hearts Made of Stone, mainly because it's such a short read. Even if it was, I think the author did really well in painting a clear picture with only seventeen pages. I liked the overall concept of the book: break up relationships for other people and make money while you're at it. The story went by quickly, just as how quickly people want their breakups to happen so they'd much rather pay someone else to do it for them. I appreciate Aaron and Dana's stark contrast. Dana's the perky, aggressive, outspoken one who really doesn't hold back when sharing her thoughts. On the one hand we have Aaron, the less upbeat, gullible one who I think is a pushover. At first, Dana's the more interesting one because she's quirky and tactless. As the story moved forward though, the change is quite noticeable. The more I got to know the real Dana, the more Aaron came into the foreground for me. It was interesting to see how their relationship failed (rather failed to take off) without actually dwelling on it because I feel if the story went that way, it would have taken the focus off of the real premise. I also liked the irony of Dana using the business service on Aaron in the end - the very service he helped create in the first place. From the moment the unorthodox business was started to the time it failed, all other parts of the story progressed with it smoothly. It was as if everything else was anchored on that single aspect of the novelette. The story was told beautifully, in my opinion. Not a single page was wasted. Arthur Carey was able to do so much with only seventeen pages. Imagine what he could have done with more. I'm rating this 4 stars because I was impressed by how much the author was able to do with a limited number of pages. Arthur Carey is a former newspaper reporter and journalism instructor who lives in the San Francisco Bay area. A graduate of the University of Michigan and UCLA, he is a member of the California Writers Club. His fiction has appeared in a number of print and Internet publications including Funny Times, Future Mysteries Anthology Magazine, Writer’s Journal, Golden Visions Magazine, Dark Treasures Anthology, Suspense Magazine and Still Crazy. He is the author of The Gender War, a recently published humor novel.